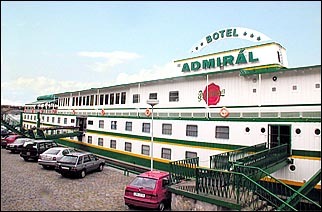 Admiral is a well-known boatel in Prague's city centre between Vysehrad and Palacky bridge. 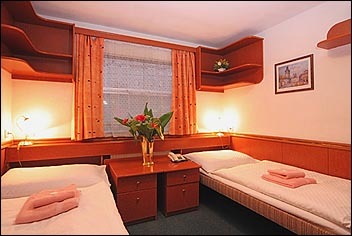 It is about ten minutes walking from Prague's Old Town on the right bank, or from Prague Castle. 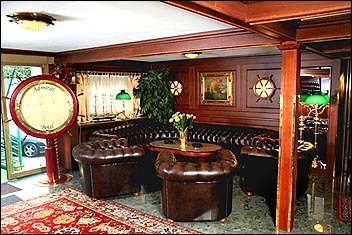 Admiral Botel was built in the Czech dockyard as the last one of three Prague boatels. 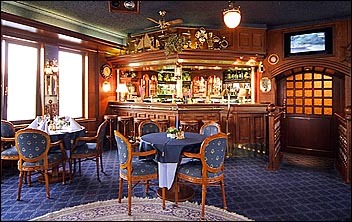 In 1971, it was anchored at the left bank of the Vltava river between the Palackeho and Railway bridges. The ship body was built as a three-floor floating object of a steel construction which is connected to the municipal facility networks with own gas heating. 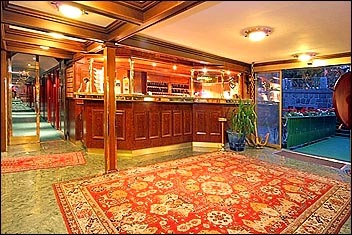 The boatel is designed for year-round hotel use and restaurant operation. After twenty years of its existence, it was privatized in 1993. Travel agency Allvatours s.r.o. became its owner and operator; the agency is a purely Czech company and a family firm. 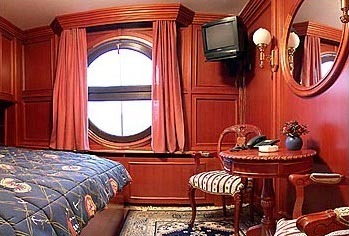 Admirál Botel has gradually undergone a complete reconstruction and gained back its glance and style. Now it is already 35 years from the time when the boatel became an inseparable part of specific atmosphere of the old Prague with a view of the Prague Castle, Emmauses, the National Theatre, Vysehrad or of Prague bridges. Cast your anchor on the favourite pier of the famous Prague poet Rainer-Maria Rilke's. 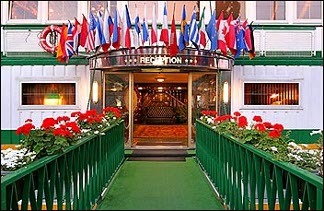 We offer romantic accommodation with a view over the river and the city in 82 double rooms and 5 quadruple bed suites. 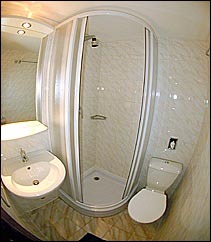 All rooms are equipped with shower, WC, TV with satellite reception, direct-dial phone and radio. Breakfast is included in the price for accommodation and is served as a buffet. 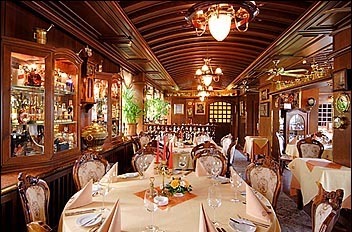 Our stylish and comfortably furnished restaurant reminds with its scent of wood decorated with brass and round tables of times of old luxury steamboat. 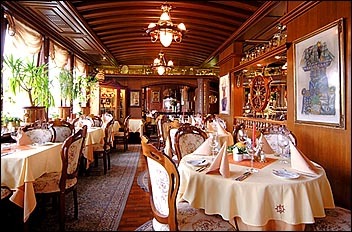 It offers pleasant seating with beatiful view of the river and the Old Prague panorama, generous selection of dishes from Czech as well as international cuisine, a wide assorment of drinks and especialy the most famous Czech beer "Pilsner Urquell". 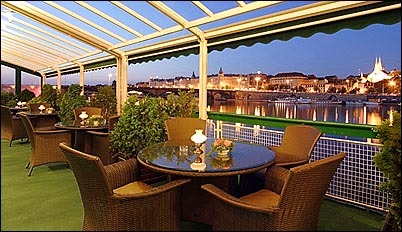 On summer evenings you can also enjoy our open boat terrace, with its view of Vysehrad, the bridges of Prague and the historical area of the town below Prague castle. We offer a wide selection of light summer dishes, fish specialities, vegetable and fruit salads, sundaes, desserts and quality iced drinks. 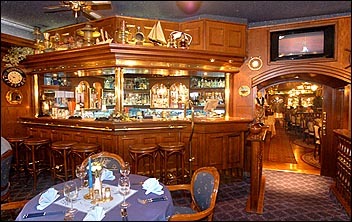 The night "Captain`s Club" in the spirit of navy academy also offers not only a rich selection of dishes but also the whole range of mixed drinks by a masive bar counter. The connection of the restaurant with the club and in the summer also with the terrace can offer with its open communication an unusual and relaxed atmosphere. This allows organizing of even big parties, cocktails, company presentation, etc. City tours and other excursions, theatre and concert tickets, transfer to the airport or railway station and many special services available at the reception desk with non-stop service. 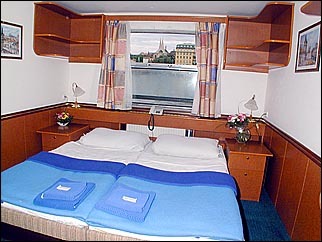 Spacious car park place for cars and buses in front of the boatel is included in the price. We can also book a garage for you for 450 CZK/day.